I feel I’ve been on a political roller-coaster this year in Illinois. I’m sure part of that has to do with my work at the political conventions last summer. Another factor you may have read about in the newspaper. And then there’s this story. The story about the Illinois governor arrested on on federal corruption charges last December. January 8th, the Illinois House of Representatives voted to impeach the Governor 114–1. The Illinois Senate subsequently convicted and removed from the Governor from office on January 29, 2009. The Illinois Senate’s vote was unanimous: 59–0. To add insult to injury, the Illinois Senate also unanimously voted to bar the now-former Governor from holding any public office in the state of Illinois. Ever. All of this raises the question: How did we get here? Veteran Chicago journalist Elizabeth Brackett attempts to explain in her book Pay to Play. In Pay to Play, Elizabeth Brackett uncovers new details as she goes behind the story of the first governor to be impeached by the Illinois legislature. All the time tracing the background of corruption in Illinois politics and its implications for state government executive branches across the country, she tells precisely how Blagojevich’s personal biography and his political upbringing paved the way for his reckless fall; what the dilemma of selecting replacement senators means for other states; what secrets the federal trial of the governor is likely to produce; why Roland Burris was selected for the U.S. Senate seat for Illinois; and how a man named Obama could emerge with integrity from the swill of this same political environment. Blame my increased interest in American politics on my employment by the fourth estate. Or my presence at both political conventions this year. Or the unusually close proximity of my home to the Election Night rally in Grant Park — and all that means for the junior senator from Illinois, now president-elect of the United States. Or maybe it’s just middle age reminding me that I should put down the comic books, turn off the video games and pay closer attention to the wider world around me. [W]e have come to vest these unelected, life-tenured judges with final authority to interpret the Constitution as well as all federal law. Yet the justices go to considerable lengths to shroud their deliberations in secrecy, and some of them, notably the current chief justice, engage in a disinformation campaign, announcing that they are disinterested referees, like umpires in baseball, engaged in the pedestrian enterprise of calling legal balls and strikes according to a clear set of rules. Toobin deserves credit for adding his influential voice to the chorus seeking to debunk this myth. As he observes, the justices are chosen through a political process for political reasons, and the decisions they reach are inevitably influenced by their ideological commitments, personal experiences and personalities. A couple personal factors have raised my awareness this election cycle. The Illinois junior senator, Barack Obama, has been a figure in the race from the earlies days of a long campaign. I changed jobs — while within the framework of media, I moved from video games to traditional media. Newspaper, radio, television. My colleagues are the reporters, correspondents, editors, and photographers that make of Tribune Company. I don’t write this to seem boastful. Quite the contrary, it has been my association with these people that has enriched my own personal understanding of news and politics in ways that I had not previously experienced. One of my major projects this year was to provide the essential networking support for our editorial staff during the two major political conventions. I read the daily paper. I work for the daily paper. My colleagues I work with are kind, insightful, curious, garrulous, demanding and intelligent. And despite the particular problems — from the general state of the economy to the specific challenges of print and advertisings to the very specific challenges of reinvigorating Tribune under new management and new ideas — I feel blessed to have the opportunity to work alongside these people. 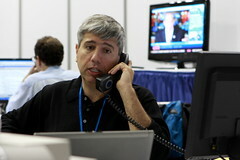 Tonight, Election Night, I am working the late shift, from the mid-afternoon to the run of press and perhaps later. I slept in before voting this morning. And I tried to anticipate what might happen tonight — to the country, to the state of Illinois, the city of Chicago and to me. 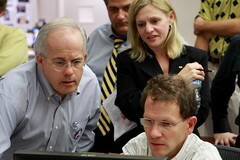 Election Night is about as big as it gets for news. This is the big night. This is politics on the grand scale and the small scale both. This is a two-year campaign, to research and polls and conversations both on and off the record. That this particular election has come down to a son of Chicago and is culminating in rally of hundreds of thousands in my back yard. I try to keep my personal politics off of this blog. I am not sure how successful I was when I was chronicling my work at the political conventions earlier this year, but I tried. My goal was to capture work-a-day experiences and write about the practical and logistical elements of my time there. I left the political opinions to my skilled co-workers from the Editorial departments. So, today, this day before Election Day, I am going to try and repeat that tone and talk a little bit about these last few days of the campaigns. You may have heard about the Rally in Grant Park scheduled for tomorrow night. My friends, John and Sabrina, have both managed to score a couple of the elusive 65000 tickets. The rest of us have been graciously invited by our Mayor to attend anyway. Not to be outdone, city officials quickly put together a scary list of steps they will be taking to manage the rally. Things like intermittent rolling street closures, controlled access, metal detectors. That sort of thing. Tonight is the big finale for the GOP. 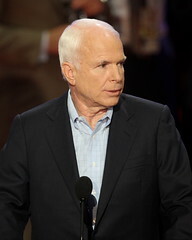 The events tonight surround the official nomination and acceptance of the presidential and vice presidential candidates, John McCain and Sarah Palin. It’s a packed house. I can’t help but feel tonight is somewhat anticlimactic after yesterday. The tone of this past week seems to have been set on Friday with the announcement of Sarah Palin– briefly derailed by Hurricane Gustav– and then right back onto Palin. Who is she? What’s up with her daughter? Is she going to come out swinging when she speaks? Some of those questions were answered last night and the response around the bureau today seems to be mostly of the opinion that she did well. Our journalists put together these headline stories: Chicago Tribune, “Palin fires up faithful, comes out swinging”. Los Angeles Times, “Defiant Palin comes out swinging”. John McCain came out onto the stage early this afternoon to go through a lighting and sound check. I got the heads up from a colleague and quickly grabbed my camera to see what kind of picture I could get– if any. As I walked into the hall, my heart sunk a little bit, looking at the sea of cameramen and photographers clustered around the new stage catwalk constructed especially for McCain’s speech tonight. So I climbed up onto the center camera platform. Nuccio DiNuzzo was up there in our position working out how he was going to shoot the speech tonight. He had all of his cameras and lenses with him: three bodies and about 7 different lenses. I meandered up with my Canon 40D and 24-70mm lens. Way too short to shoot anything directly. Just wide shots of context. DiNuzzo asked if I wanted to use his 400mm. I blinked and then jumped at the chance. DiNuzzo shoots Canon gear and the lenses are interchangeable among all the bodies in the EOS line. So I pulled off my lens and snapped the body onto this huge lens. The Canon EF 400mm f/2.8L IS weighs almost twelve pounds and is monstrous. For about 10 minutes, McCain came out and took in the shape of the hall. 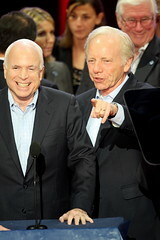 Joe Lieberman joined him at one point and McCain took some notes from a number of handlers. I snapped away for most of it. Toward the end of the sound check, DiNuzzo asked for his lens back and I went back to my shorter portrait lens. I got a couple pictures of the photographers around the new stage and one of DiNuzzo hard at work at his craft. 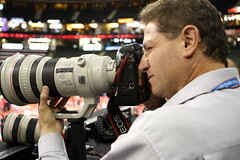 I thought it was very cool to get to play with that lens. For a moment I got to be a real photojournalist. If only in my mind. So this is it! This is the last day of the two conventions. I have one more day of work tomorrow– tear down and packing up. That should go pretty quickly and easily. It will be the last major responsibility I have for this project. I’m looking forward to going home. It has been a long, strange, fascinating trip. You don’t understand! I could have had class, I could have been a contender. I could have been somebody. Instead of a bum, which is what I am. I snagged a credential to get me into the hall for Romney and Huckabee’s speeches. 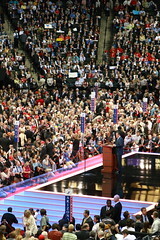 I crouched behind our journalists in the daily press writing press stands to the left of the stage and looked out over the crowd of delegates. The atmosphere inside the hall during these speeches was powerful. The speakers were playing to a partisan crowd, to be sure. And the messages sent were intentionally crafted to be incendiary– firing up the base of the political party. That I did not mind; that effect is a function of these conventions. And I did not particularly mind the difference of political opinions being expressed when compared to my own. There were two particular elements I did mind: the appeal to fear and the the broad disparity between what was said to motivate and the subsequent policies enacted once in power. Mitt Romney’s attacks on liberal government were crystalline examples of the latter. Rudy Guiliani’s incessant waving of the bloody shirt the epitome of the former. So for the first time I get to really watch the process of a full day of news production in the bureau. By the time the second day of the DNC came around and I was comfortable with the setup enough to play ‘fly on the wall’ I had to hop on an airplane and come to St. Paul. Yesterday was a highly abbreviated session due to Hurricane Gustav. So today was the first real day. It was interesting to watch, to just be a part of and absorb as it happened around me. But I want to back up and talk a little bit about last night. I spent most of yesterday evening with two of the photographers from the Los Angeles Times. I met up with Genaro Molina and Myung J. Chun back at the hotel. I’ve been talking to them off and on over the course of the last few days, mostly legitimate work-related topics dealing with the setup and logistics of shooting the convention. What services are available where? Where can I get credentials? What’s the best way for me to upload these pictures quickly? Last night I sat down and talked with them both in some depth about their careers in photojournalism. What they like about it, what they could leave be. Challenges with competing with the wire services, particularly for Internet content. We talked about the conversion from film to digital in late 1999. The place for still photography in journalism. Chun had a number of interesting thoughts on that topic as he moved from still photography to video about six years ago. The whole evening was entertaining and enlightening. They were both very forthcoming and engaging. I really enjoyed the opportunity to talk shop with them. And then to get to follow up that conversation with observing them work– the selection of shots, the submission, and the anxious wait to see what, if anything, had been selected. This is another of the sort of immediate, visceral experience I was hoping to have. It was good. As for news stories of the day, they were primarily follow-up to the stories from yesterday: the aftermath of Gustav, the imminent threat of three more named storms in the Atlantic, further fallout and discussion of Bristol and Sarah Palin. Some of our journalists are still working that story. Rumor is that Levi Johnston, Bristol’s boyfriend, will be in attendance at the convention tomorrow night when Sarah Palin is scheduled to speak. A number of other journalists have moved beyond this story and on to investigate Sarah Palin’s executive work. They are taking a hard look at her apparent change in position on the Bridge to Nowhere in Alaska. Tom Kole, Broadcasting Manager of the Washington DC bureau, commented to me first thing in the morning as I arrived about Sarah Palin’s apparent change in position regarding the Federal funding about the bridge. Look for more of these sorts of stories as the news media scours her Alaskan political career. With Gustav dissipating and the New Orleans levees still intact, hurricane hunters looked further east in the Atlantic and reported three tropical storms now with names: Hanna, Ike and Josephine. Some or all of these storms may develop into hurricanes and head toward the United States. None of them will make landfall in the US before the close of the Republican convention, however, so it looks to be a return to more normal activities here in the hall. Two other small items. 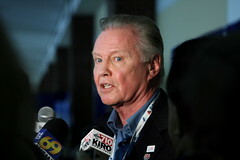 First, while poking around the hall this morning before the session opened, I ran across Jon Voight on Radio Row. Radio Row is the name for a section of the conference center set aside specifically for the use of talk radio. Their setups are not particularly fancy: usually a table, three or four microphones, some audio equipment, a phone or two, maybe a television or a laptop. But there are dozens of these setups, one right next to the other running the length of the hallway. Radio Row is actually four rows set up like this in parallel. 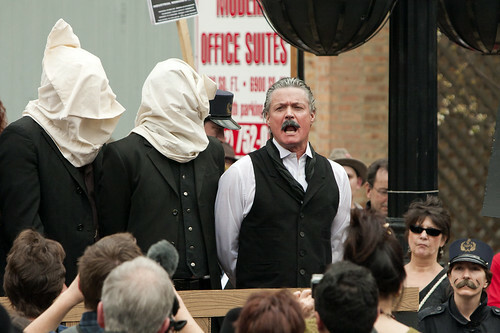 Voight had been cornered by a mob of print, radio, and television journalists when I happened across him. At the time he was answering questions about Bristol and Sarah Palin. Bristol’s pregnancy continued to be the big news story throughout the morning. Jon Voight has been vocal about his political opinions this election cycle. Last week he published an opinion piece critical of Barack Obama in the Washington Times. I suspect that publication has something to do with his appearance at the convention. Second, Ron Paul hosted a sell-out crowd in Minneapolis today for his “Rally for the Republic”. I believe Ron Paul’s Libertarian-leaning, conservative politics pose an intriguing dynamic for the Republican party and I leave you tonight with a brief glimpse into the rally as presented by Myung J. Chun. Hurricane Gustav made landfall south and west of New Orleans today as a Category 2 storm. This was down from the Category 3 classification last night. Many meteorologists expected Gustav to grow in strength to Category 4 rather than lessen. So the hurricane made landfall with strong winds, rain, tornadoes and storm surge of 6-8 feet. We’ll see what sort of long-term impact the storm has for Louisiana and Texas over the next several days, but initial reports seem to indicate that this hurricane has not had the dramatic effect that Katrina and Rita did three years ago. I may be premature, but I suspect that its impact on the Republican National Convention in St. Paul will be minimal and shortly the convention will return to its more typical course of events. So, go out there and read the papers, find out all the rest of the scandal. These people are working hard to bring it to you. The word of the day is: Gustav. This hurricane has impacted Haiti, the Dominican Republic, Jamaica, the Cayman Islands, Cuba and is now bearing down on Louisiana. It is almost three years to the day since Hurricane Katrina followed a similar path through the Caribbean, the Gulf of Mexico and through New Orleans. When media outlets began covering this storm last week I thought the attention was a bit premature. Today, with the hurricane a couple hundred miles off the coast of Louisiana and the National Hurricane Center predicting the storm should grow in strength before it makes landfall, I think the hurricane coverage is more appropriate. 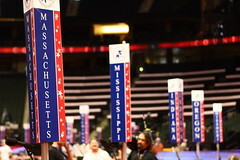 In light of the storm’s approach on Louisiana, the Republican National Committee and the McCain campaign today decided to significantly curtail the extent of their national convention. We had been warned that these changes might take place and they outlined the specifics for us at 3:00 pm this afternoon. Tomorrow the convention will begin as scheduled, but in abbreviated fashion. They will ensure a quorum to do business, constitute the convention and fulfill the basic minimal requirements necessary to make the convention a legal and binding event in the political process. Nothing more. No political rhetoric. No additional activity. Going forward the RNC will hold a political briefing each day at noon with the specific details of the schedule of events they have planned for that day– and that day only. They are approaching this set of circumstances on a day-by-day basis. The carefully-scripted playbook of speeches and entertainment has been tossed out the window. I was quite interested to learn that this is the first time a national convention has been altered due to external concerns like a natural disaster. This was a very different sort of day than the evening before the DNC in Denver. — I have commented several times on the difference in tone around the site, and now external factors have tossed a new variable into the mix. I spoke with a number of reporters, engineers and photographers in our temporary bureau, trying to get an idea of their feelings about these changes. Many of them were anxious to get to Louisiana and cover that. I eavesdropped as Jim outfitted the Los Angeles Times Midwest Bureau Chief, P.J. Huffstutter, with a satellite phone and portable video camera. I talked briefly with her about why she desired to go to Louisiana. She had covered rural Louisiana and Mississippi after Katrina and Rita three years ago and said that while the work was difficult and unpleasant– hot, loud, living out of a car– the stories were incredibly compelling. One of my personal goals with this project is to get a small sense of what it is like to work in a newsroom. And for a little while today on the first official day of production I got that wish. I hope I will expand on that experience over the next several days.